If someone makes a lot of money (legally and ethically), it is probably also good for the economy and the people around him. That's something I remember from Economics. People like that are usually looked upon as rich. Some might not be very good at making a lot of money or might not have the inclination to make a lot of money. Does this mean that they cannot be rich? Regular readers know my answer to this question. No matter how much money we make, if we spend more than we make, we are in for some trouble. However, this might not be the case for some lucky people. From the comments section: here. "When my sister-in-law died, he inherited the insurance money .... and blows $700K within 1.5 years. 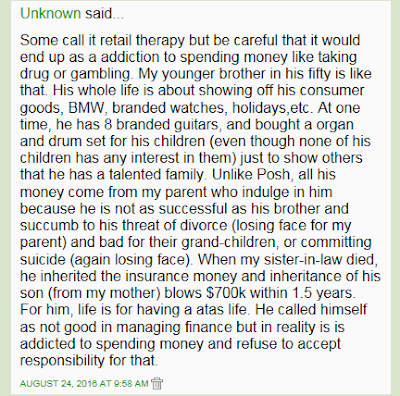 "He called himself not good in managing finance but in reality is addicted to spending money and refuse to accept responsibility..."
"Of course, sometimes, people need to suffer a fall before they are aware of their financial mortality." Some people are lucky enough not to have to suffer a fall. So, they live within an illusion of financial immortality. The operative word here is not "immortality". The operative word here is "illusion". Wonder why some will never be rich? Having the right philosophy in life will guide us on the right path when it comes to money matters. Remember the 3 attributes of a wealthy peasant: HERE. 1. From rich to broke. 2. If we are not rich, don't act rich. Talking to some of my friends, they don't believe a frugal lifestyle or even do any type of planning. Money should be spent. Usually I get a reply that life is uncertain -- our mortality is uncertain. Financial mortality? Let's not think about it. They cite incidents of people who are frugal and something bad happened to them. If life is short, why suffer while we are living. After a while, I realised, people like you are exception, hence I often joke about the Paradox of Thrift. If everyone saves, everyone is poorer. The YOLO mentality is quite common. I don't want to be destitute. Growing old and destitute would be an absolute nightmare. It is not your mistake if you are born poor. But it is your mistake if you die poor - Bill Gates. The biggest thing in my life is not getting rich, but to protect my family from proverty. A practical gift from us to our loved ones is not becoming a financial burden to them in our old age. Leaving any material wealth behind when we die is a bonus for them. :)"
It is the sensible and responsible thing to do. Embracing 养儿防老 as a philosophy could disappoint. I agree with AK too. Inheritance is a bonus to the beneficiaries. The best present that a parent can give to his children is to be self-sufficient, independent in thought and acts, and a productive member of the society. Central to this is never to be a burden to the society. Last night there this a show in Channel 8 called Incredible feats. There is this blind lady who can "See" what is in front of her by continuing emitting sound from her mouth and by listening reflected sound can move freely without help. He correctly identify the no of objects in front of her is a real persons or a mannequin. When asked how did she acquired this skill. She replied she was abandon at birth by her parent when they found out that she was blind and she was brought up by one of her grandmother. Her grandma wanted her to live an independent life because she knows she cannot look after her forever. She would make her walk and go about since young on her own without the grandma help. She would fall down but the grandma would not help her but just encourage her to adapt. Soon she discovered that she is able to "See" the world by emitting soft sound and sense the objects in front of her. Now, she is gainfully employed as a piano tuner and a featured activist in China for allowing "seeing dog" to be allow in public amenity. Her story was an inspiration and many in the audience and judges were moved in tears. The curse of a child is over-indulgence from his parent/grandparent, especially with material stuff. Someone suggested setting a trust for my brother. I would disagree with such a proposal. It is feeding drug to an addict so that he can survive. No logic as all. But then again, this is just my opinion. "The curse of a child is over-indulgence from his parent/grandparent, especially with material stuff." I agree wholeheartedly and I blogged about this before when I said Have a genie and even children can enjoy passive income. Some wonder why they are not rich? His worst enemy is himself. It may not be 700k, but plenty of people blow whatever they have above minimum sum at 55 in even less time. I've had relatives in my parents' generation decide to blow it all on a luxury trip for the entire family. 30 years savings spent in 3 weeks.